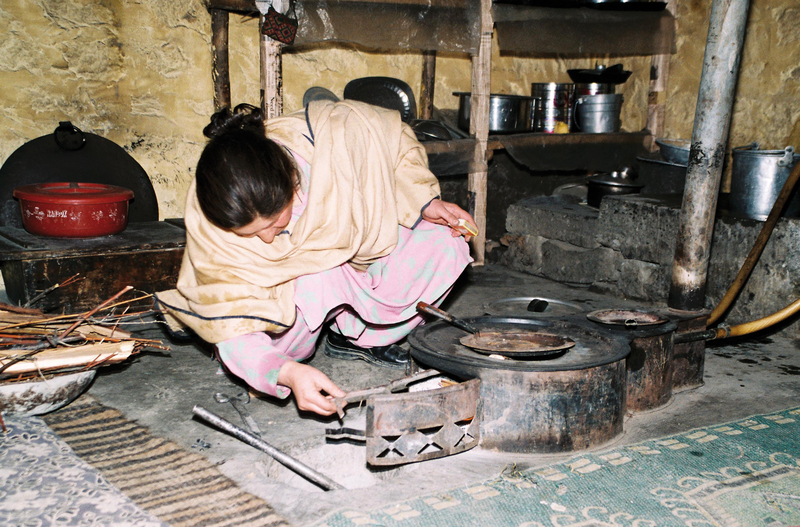 BACIP smoke-free stoves have improved the quality of life for poor families in the Northern Areas and Chitral, particularly for women and children under the age of five who suffer from unacceptable levels of indoor air pollution. The Northern Areas and Chitral are amongst the most remote areas of the high mountain regions of Pakistan. Living conditions are harsh, with an average household income of US$ 0.50 per capita per day and an unemployment or underemployment rate of about 70 percent. The poverty is reflected in deteriorating living conditions, which have led to major health-related problems. To help address these issues in a comprehensive way, the Aga Khan Planning and Building Service (AKPBS) in Pakistan set up the Building and Construction Improvement Programme (BACIP). Building on traditional knowledge and international best practices, the programme develops, tests and applies methods, products and technologies that can improve living conditions. Over 70 different interventions have been created, ranging from smoke-free stoves and screened kitchen cabinets for storing food to water heaters and ventilation systems. The impact of BACIP techniques and products in programme areas include the reduction of biomass consumption by 60 percent (approximately 3.3 tons per month) leading to a monthly saving of US$ 30-36 (Pakistan RS 1,800-2,200); a 50 percent decline in the incidence of acute respiratory infections, pneumonia and other respiratory diseases in women and children, especially during winter months, and a reduction in health-related household expenditures of approximately US $58 per year (Pakistan RS 3,500); a 25 percent increase in household income; and a 10 percent reduction in recurring house maintenance costs. BACIP has been successfully replicated in over 100 villages in the Northern Areas and Chitral and in other high mountain areas outside of northern Pakistan by government and civil society organisations. In the hot and humid climatic conditions of the Thatta district of the Sindh province, which borders on the Indian Ocean, the concept has been applied by AKPBS and other civil society organisations supported by the United Nations Development Programme (UN DP). AKPBS received the World Habitat Award 2006 for its efforts to improve housing conditions in Pakistan. BACIP has also been listed as a useful case study by UN -Habitat and the UN DP Global Environmental Facility/Small Grants Programme.